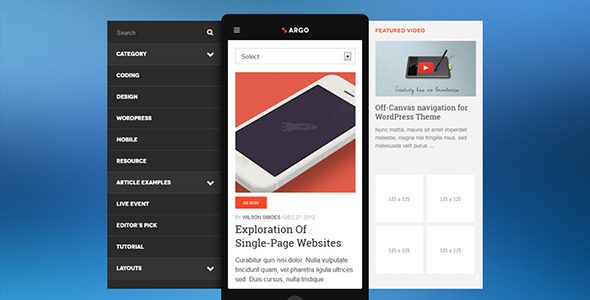 Responsive WordPress Theme DW Argo – Outstanding WordPress theme for News and Magazine portals. Trendy design, simple and clean layout, fully responsive, DW Argo is a compelling WordPress theme that would make your news & magazine website stand out. The theme features outstanding features and functions like sticky header, off-canvas navigation for mobile devices and tablets, keyboard navigation and a shop page using Easy Digital Downloads. You are wondering why a news website would need a shop page? Well, if you look at some of the top online magazine websites, they do have a page selling digital products: Smashing Magazine has a Shop selling their e-books, or Designmodo has Website UI Kits store. This will likely to be a trend in the future. 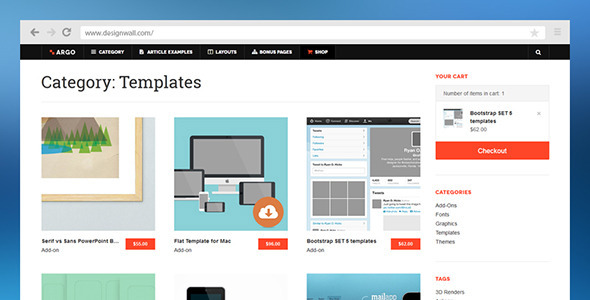 So, in our WordPress theme, we integrate a shop page using Easy Digital Downloads (EDD) plugin. Not fancy to have a shop, you can simply turn off this page in the back-end anytime you want. EDD is one of the popular WordPress plugin, aiming to make selling digital products easily and completely through WordPress. The plugin supports various features like purchasing multiple downloads, many payment gateway support, payment history, sales chart and so on. This features will make things much easier and faster in creating a nice product gallery where each product contains many images. It is common to have comment and review on a single product page, however, EDD default does not support this feature yet. We make it happen in DW Argo. First time introducing in this theme, we use a feature called Product Metas to help you create unlimited number of product attributes you want to display. Quick and easy are what you will experience about this feature. In addition, we also support Font-Awesome 3 for the icons, more choice for you to customize the product attribute. The slideshow in a website plays an important part as it decides your website is attractive enough in viewers’ eyes or not. Now give your website slideshow the personal taste that you want. In this theme DW Argo, Adding/Editing a slideshow becomes easier with improvement in the back-end functions: drag and drop images, section to edit image information like title, caption, description and redirect URL. Carousel Slide is applied for slideshows on Homepage, Main shop, Shop Category and Single Shop Item page. 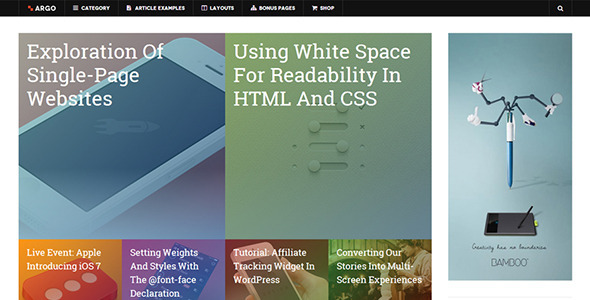 Looking for an inspiring theme for your WordPress news site? DW Argo is here to answer your call. Check out the demo and decide it for yourself. 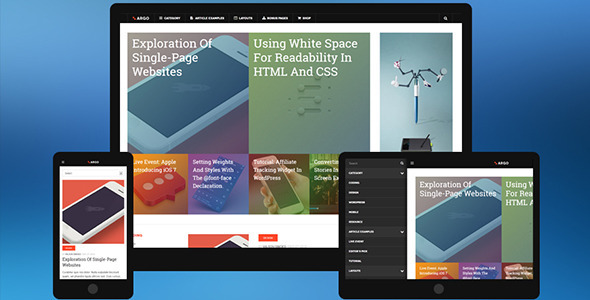 * New: Fully compatible with Wordpress 4.1. * New: Auto update theme function. * Fix: Print page layout overlap. * Fix: Tab and accordion Widget bronken layout in back-end. * Fix: Bugs in widgets page to be compatible with WordPess 3.9. * Fix: Remove Meta_Box class issue. * Fix: Comment issue in Pages. * Tweak: Restyle category links in single post. * FIX: Crop thumbnails size in Metro area. * FIX: Localization & translation: Textdomain conflict. * FIX: Top menu issue on mobile devices on WordPress 3.8. * NEW: Add Metro content filter to Customize panel in the back-end. * FIX: Save widgets on Firefox in WP 3.8. * FIX: Fix bugs in widgets page to be compatible with WordPess 3.8. * FIX: Save settings in homepage slides. * FIX: Large logo getting cut off. * FIX: Change Site title at footer based on Site title in Customize settings. * FIX: Support responsive video and embedded images in a post. 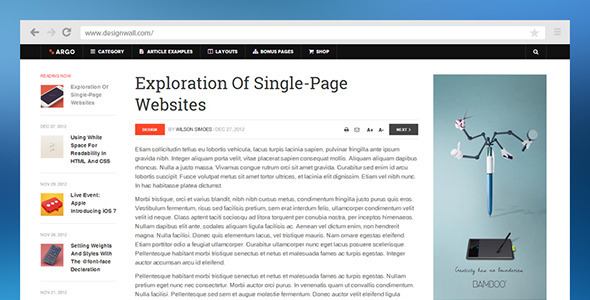 * FIX: Remove hard-coded value at content single page and social share buttons. * FIX: Off canvas navigation issue on mobile devices. * TWEAK: Compress CSS & JS files, remove unnecessary code. * TWEAK: Restyle Top Menu, Blog pages, Shop pages. * NEW: Restyle to be compatible with DW Question & Answer Plugin. * NEW: Support multi-level menu in left sidebar. * NEW: Add the new Topbar position (above the Metro grid). * NEW: Add the new settings below to the Customize panel in the back-end: Logo, Site title, Metro Grid colors, Style Selector, Font Selector, and Custom Code support.